On New Year's Day, we celebrated our 25th anniversary at Dunbar Associates! I am very grateful to the 300 clients who allowed me a chance to go inside their businesses. In any consulting activity, there is an exchange of ideas. Implementing a comprehensive food cost control system involves reviews of many mission critical systems: POS systems, vendor online ordering systems, catering banquet event order systems, bar code scanning solutions, accounting systems, and lots of Excel files. In 1990, the best tools available included Lotus 123, Micros 2700 POS systems, Hayes modems, floppy diskettes, fax machines, and Novel networks. PC Anywhere, WinFax Pro, faster modems, DSL phone lines and numerous computer devices helped to improve connectivity. After 1995, the speed of innovation picked up tremendously as the world moved quickly toward 1/1/2000. Y2K solutions and new dotcom websites helped technology companies grow faster than the economy. Many software developers needed to transition from their DOS environment to the newer Windows environment. It was a fascinating time to work with food service companies. Today, we are all connected with powerful online tools. Many of the essential pieces of the puzzle for back office pros in 1990 are obsolete. Lotus 123 lost out to Excel. Floppy diskette drives are no longer mentioned. USB ports and DVD/CD drives are used today. I have not seen a Novel network in years. During 2015, I welcome any of my clients to contact me for any projects. For the entire year, you can hire Dunbar Associates for the same rates you paid when we first met. In late 2005, I started this blog. The blog celebrates it's 9th anniversary with a new report store FoodCostWiz Reports. Our first report, Visual Portion Control, is available at 50% off the $9.95 price - $4.95. 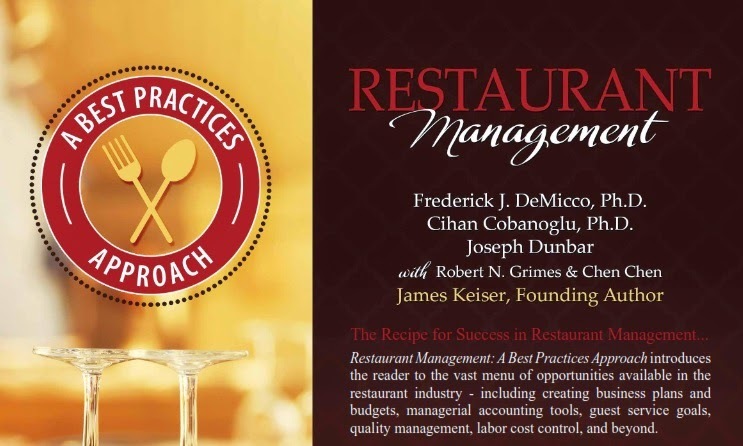 In a few weeks, our new text book will be available for restaurant managers, educators and students. Please stay tuned for more information.